Bartlesville police continue to investigate the human remains found near the Parkfinder Parkway last month. According to Public Information Officer for the department, Captain Jay Hastings, police were contacted by a man checking an oil lease between Frank Phillips and Adams when he found human remains. Hastings says Tulsa fire fighters, Oklahoma Task Force One and Kerry Cox with Washington County Emergency Management have been helping reveal who the remains may have belonged to. Tulsa fire fighters have been able to use a drone to look for remains, if any, near the banks of the Caney River. Four Cadaver dogs with Oklahoma Task Force One have been used to help search for further remains as well. Kerry Cox with WCEM has been able to provide additional personnel to help search for further remains. The man’s remains that have been found, according to Hastings, have brought them closer to identifying who the man is. It has been discerned that the man was transient and not from the area. The medical examiner’s office wants to be 100-percent positive of the man’s identity before releasing a name. Hastings says that may include doing DNA tests on the family. A wallet was found in the area and it identified a man from the Grove area. When the family was contacted by police, they told them that the man was kind of a drifter. The family mentioned that he had been missing for about two months. 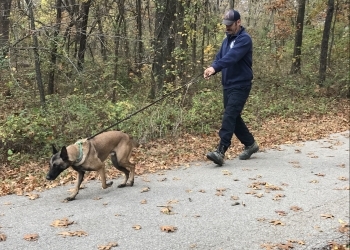 During their search on Tuesday, the Bartlesville Police Department and other officials couldn't find any further remains. We’ll have more information when it becomes available.